NetQin is one famous mobile antivirus company with over 60 million users. They are in the mobile security field from 2005 onwards, and they have more popularity in Chinese market. The first versions of the NetQin Mobile Antivirus were for mobile phones in Symbian platforms. Now NetQin Mobile Anti-virus English edition is available for Symbian, Windows Mobile and Android devices. You may think that the software is not as good as Kaspersky, F-secure, ESET or Symantec Mobile security solutions. But with the number smartphones increasing at a faster rate, theft has become a more serious problem than virus infections. NetQin Mobile Anti-virus has an advanced Anti-Theft feature, and it is completely free download for the Android, Nokia and WM users. Mobile antivirus: NetQin Mobile Antivirus databases are constantly updated over the internet. The application provides real-time protection against threats affecting the corresponding mobile platforms. Contacts Backup: The Contacts Backup feature in NetQin Mobile Antivirus 4 let you backup your contact list to a storage card or in your account with NetQin. Later you can restore the backup to the phone or sync it to another Symbian, Android or Windows mobile device. All you need to use the same NetQin Mobile account details. Mobile Anti-lost: Most desirable option in NetQin Mobile Antivirus 4 is the Anti-lost function. The same feature is available in Kaspersky Mobile Security and some other products. But there you have to pay for the service. NetQin Mobile Antivirus can track the location of the lost device by using GPS satellites and mobile tower position of the stealer. There are also options to trigger an alarm sound on the stolen device, or completely delete the private data using SMS commands. NetQin Mobile Antivirus 4 for Android here. 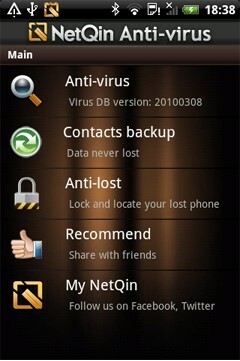 Download NetQin Mobile Antivirus4.0 for Nokia(Symbian) S60V5, S60V3. NetQin Mobile Antivirus 4 also has a VIP only- premium feature called Anti-eavesdropping. This module prevents any unauthorized phone tapping in Symbian devices. nd does it make stil slow after installin it.. It is good that NetQin Mobile Antivirus databases are constantly updated over the internet. Unknown file format for my Xpress music!